Meet the Kerala family that has been creating ‘Onavillu’ for Onam for centuries …! The Vilayil Veedu family is the only family entrusted to make the ‘Onavillu’ that is offered to the deity at Sri Padmanabhaswamy Temple. For the Vilayil Veedu family at Karamana it is a busy time of the year. 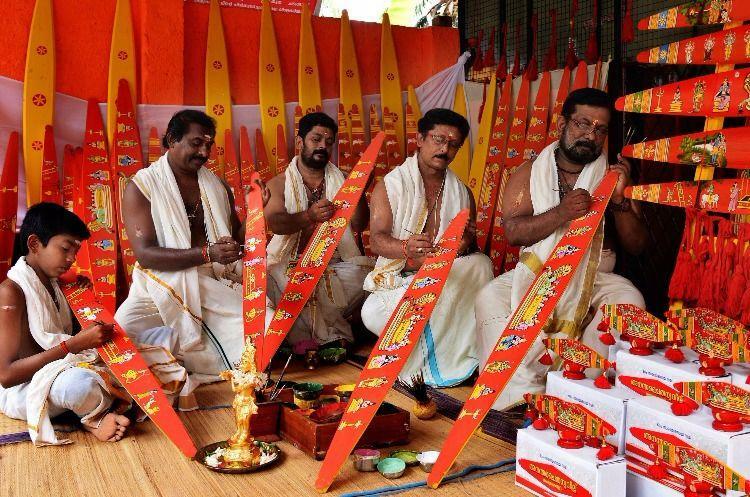 The family of traditional craftsmen is the only family entrusted to make the ‘Onavillu’, a ceremonial bow that is offered to the deity at Sri Padmanabhaswamy Temple here as part of the annual rituals during the Onam festival season. Their house wears a festive look, as all the five male members of the family, including a 12-year-old, immerse themselves in the task of crafting these colourful bows. “In these bows, we paint all the avatars of Vishnu. 12 of them are offered in the temple as a part of the ritual. Nowadays, even more, numbers are being offered at the temple. They consider it holy and keep it in their pooja rooms as well,” Binukumar, one of the craftsmen from the family, told TNM. The bow is a broad piece of wood, tapering on both sides, on which miniature paintings of the Ananthasayanam, Dasavatharam, Sreerama Pattabhishekam and the Sreekrishnaleela are portrayed. Earlier the ‘villus’ were 3.5-4.5 feet long and 4-6 inches wide. But, now the family have introduced 1.5 feet long small bows that can be used by everyone. The making of the Onavillu is an age-old tradition that has continued over the years from the 16th century. The family members observe a 41-day penance prior to the commencement of the work. “We have to be pure while we make this. We are vegetarians and follow certain other norms while making it. There are certain mantras to be chanted while carving and drawing each Onavillu,” he added. Earlier the making would take place only during the Onam season but now with people buying for their home, the craftsmen work throughout the year. The red tassels used to adorn the ‘villu’, which is known as ‘Kunjalam’, are made by the convicts of the Central Jail at Poojappura here. Last week the jail authorities handed over this year’s required ‘Kunjalam’ to the Vilayil family. “Kunjalam making was started decades ago by the jail inmates. There is a weaving unit in the jail. The Kunjalam was prepared under the guidance of the instructor. We make it as per the order given by the temple,” S Santhosh, Poojappura jail superintendent told TNM. He also says that even the prisoners observe penance before and while weaving the Kunjalam. “They don’t take any non-vegetarian food, make themselves clean before starting the work and also do certain prayers,” he added. Binukumar said that at prison these ‘Kunjalams’ are made by the inmates irrespective of caste or religion. “People belonging to all religion are involved in the making of Kunjalam. Surprisingly they all observe the penance so that the Onavillu’s holiness is not lost,” he added. The ‘villus’ are first offered to the family deity at the Valiya Veedu for three days. They are then taken to Sri Padmanabhaswamy Temple on Thiru Onam day and displayed at the Natakasala before being offered to the deity.